Meglio rischiare sfruttando la propria demenza che ripetere la solita solfa vista e rivista. Ma tornerò con un altro articolo in futuro su queste cose. 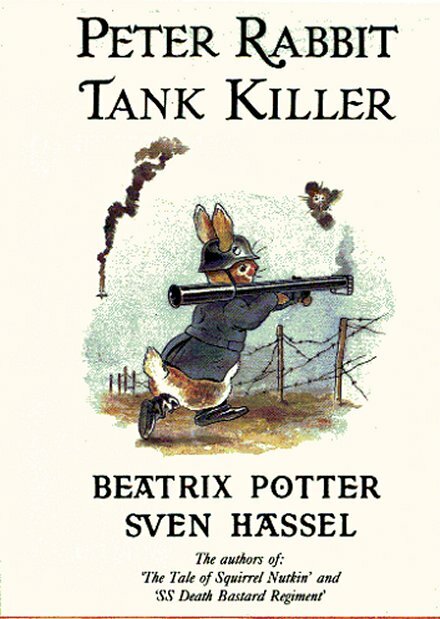 Oggi volevo solo segnalare “Peter Rabbit Tank Killer”, racconto che mischia il celebre Peter coniglio di Beatrix Potter con elementi della seconda guerra mondiale alla Sven Hassel. Viene da The Book of Revelations di Mark Leigh e Mike Lepine, pubblicato nel 1988. Il libro è una raccolta di parodie proposte come documenti contenenti verità nascoste riguardo la storia e la cultura popolare. Secondo me è incredibilmente figo. Io adoro i conigli. Once upon a time there were four little rabbits, Flopsy, Mopsy, Cottontail and Peter. 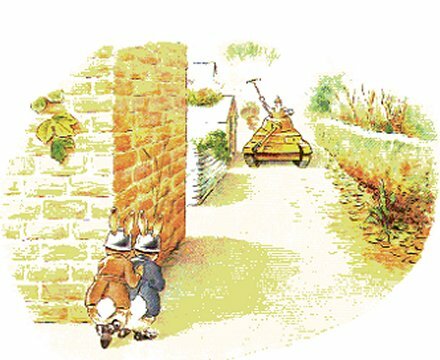 They lived with their mother, old Mrs Rabbit, in a warren at the bottom of Mr McGregor’s garden. One day, the little rabbits’ mother said, “I am going to market to sell some mittens that I have made. 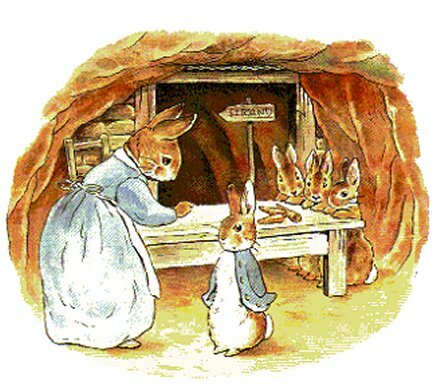 You may all play in the wood if you wish but, Peter, you and your naughty cousin Benjamin Bunny are not to make Mr McGregor cross nor blow up his potato patch again.” And with that, she left in a swish-swosh-swish of rustling skirts. But oh! The Peter was such a naughty rabbit! No sooner has his mother left than he dressed for combat, put on his helmet and hopped off to the end of the lane to meet with his cousin Benjamin. As the two young rabbits exchanged greetings, they suddenly became aware of a mighty a-clinking and a-clanking coming up the road! With their little hearts all a-flutter, they peered judiciously around the corner. And what do you think the two naughty rabbits saw when they peeped out? Mr McGregor in a huge tank with a giant cannon and two machine guns! “Be quick and fetch the rocket launcher from Tom Kitten!” whispered Benjamin. So Peter went hipperty hop all the way to Tom Kitten’s house. Tom Kitten gave Peter his rocket launcher willingly, for Mr McGregor had scolded him once. But by the time Peter returned to his cousin, Mr McGregor had driven up the path and opened fire on Jemima Puddleduck, setting fire to her best summer bonnet. 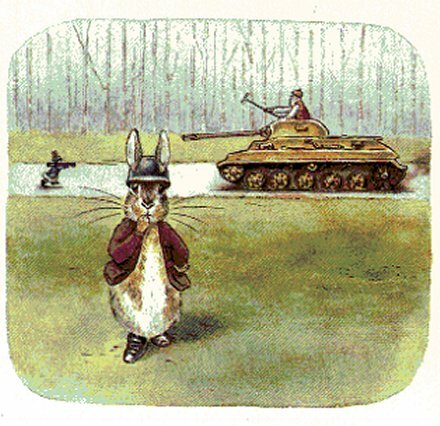 “Thank goodness you were a fast rabbit, Peter” cried Benjamin, as the turret of the tank slowly turned to the humble abode of Mrs Tiggey-Winkle. Peter steadied the rocket launcher on his shoulder and squinted one little beady rabbit eye down the sights. Now, rabbits eat a lot of carrots and every child knows that carrots do your eyesight the power of good, so of course, Peter did not miss. The missile from the launcher slammed square into the front of the tank, stopping it on the spot, thereby solving the pretty little pickle they had found themselves in. “Take that for putting my father in a pie” shouted Peter and gave a little rabbity hop for joy. 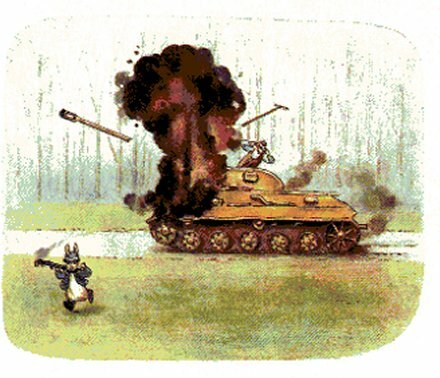 As the flames from the tank died down, the two little rabbits exchanged salutes, promised solemnly to meet again next Thursday and then hurried back to their homes. Oh dear! Old Mrs Rabbit was distraught when she learned what her naughty son Peter had been doing. Flopsy, Mopsy and Cottontail, who had not assaulted any armoured vehicles, were rewarded with fresh lettuce, carrots and radishes. Peter was sent to bed without any supper, but then, who wants to eat that rabbit food anyway? Oddio, a leggere questa frase mi sono piegato in due dal ridere XD Altro che non accettare le caramelle dagli sconosciuti! Non mi piacciono queste storie tristi >_< Mamma Coniglio è davvero troppo severa per agire in un libro per bambini, i pargoli potrebbero restare impressionati! I conigli sono terribilmente erotici. Li adoro. Culetti saltellanti, botoli di pelo con le orecchie tutti da gangbang-izzare! Voglio urban fantasy con conigli antropomorfizzati.